Sher Bliss is proud to introduce our newest creations! We discovered a new superfruit, Baobob pulp, strawberry shown here, a new superfruit, is macerated in the red wine and infused into our creamy fudge recipe. The fruit brings out the roundness and dark fruit and cherry in ths silky, rich wine. Wine biscuits are hand-crafted, baked right here in the store using a unique Italian recipe, The biscuits are made with the Mouton Cadet Bordeaux, seen in the gift pictured above. The Rose is dipped in white chocolate and sprinkled with boysenberry crushed candies, bringing out the fruit aromas. The combination of three bottles of Mouton Cadet wine, wine biscuits and unique fudge create a fantastic gift for the fine wine and chocolate enthusiast on your gift list. Stop by the store to pick up this delicious and creative present at just $79.95, or add individually wrapped chocolates with “Happy Holidays”, or “Thank You” message printed on the foil. for an additional $9.50. Call 614 428-9463 for orders, questions or more information. We have paired up with Dill’s Greenhouse for this one! From our two favorites vines, sample the lovely tomato paired with wines. The tomato crops promise to be fabulous this year, you won’t want miss this. Gazpacho, paninis and other tomatoe-y treats will be served! Sample these great gift ideas, wine for many hobbies and personalities. One of our favorite tastings! Taste to understand why certain food and wine combinations are so perfect. In this cooking class we will cook with beer, show you how to make a few different eye-catching and delicious tailgate treats that naturally pair with beer and of course, sample new seasonal brews with the apps you prepare. Fall’s bounty presented in a healthy and intriguing new menu. Includes dinner paired with beer or wine flight. 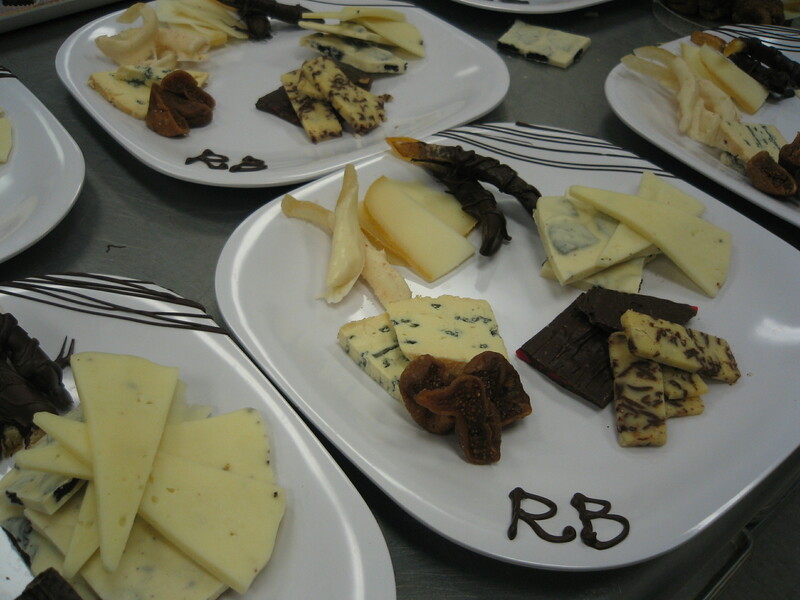 Rediscover Germany at this one of a kind Rieling tasting and cooking class. Our importer from Rudi Weist will conduct this unprecedented event while sampling the fabulous port. Makes a great date night, or gift. Celebrate the New Moon in Scorpio with your friends at Zodiac & Sher Bliss! There’s nothing like wine tastings and tarot card readings under a magic new moon to kick off Halloween weekend! With Halloween themed flights $15 per person. April 3-6 anytime during normal store hours from $1.00 per taste, sample Passover and Easter wines to suit your menu. April 20 Sake! 7-8:30 PM $15 per person with Julia from Vintage. 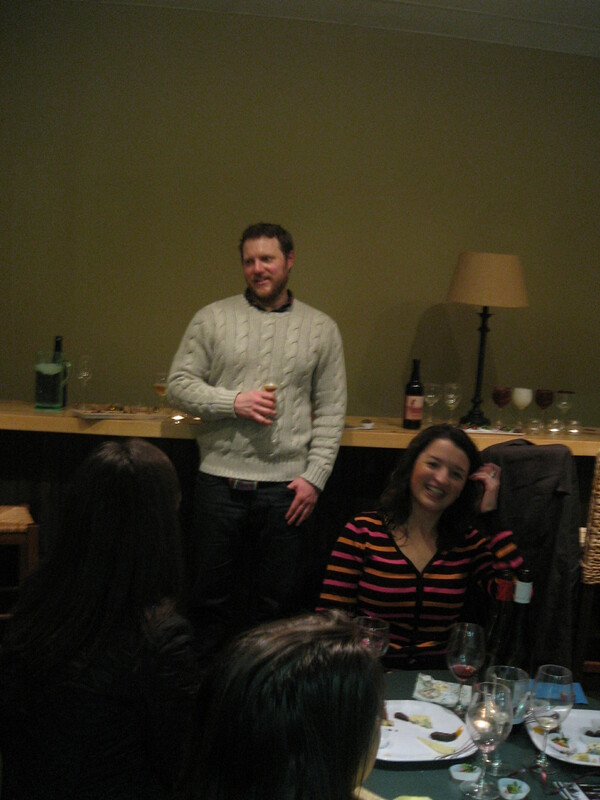 April 27 Orin Swift Superstars…and friends $15 per person; Luke from Vanguard facilitating. April 28 Goose Island Beer Company 4-5:30 PM $15 per person, or 2 for $25 includes chocolate and cheese pairings; meet Sara, our brewery representative. May 4 Roses and Barolos, 6-7:30 PM $20 per person, once again believing there is something for everyone! Hosted by Winess LLC. May 10 7-8:30 PM $20 per person; this one is with the amusing and informative Jackie from Glazers for an interactive and educational component tasting. Call it Food & Wine 101! June 1st 7-9:00 PM $15 per person; sample the wines of Oregon. for your at-home pleasure, or gift-giving. 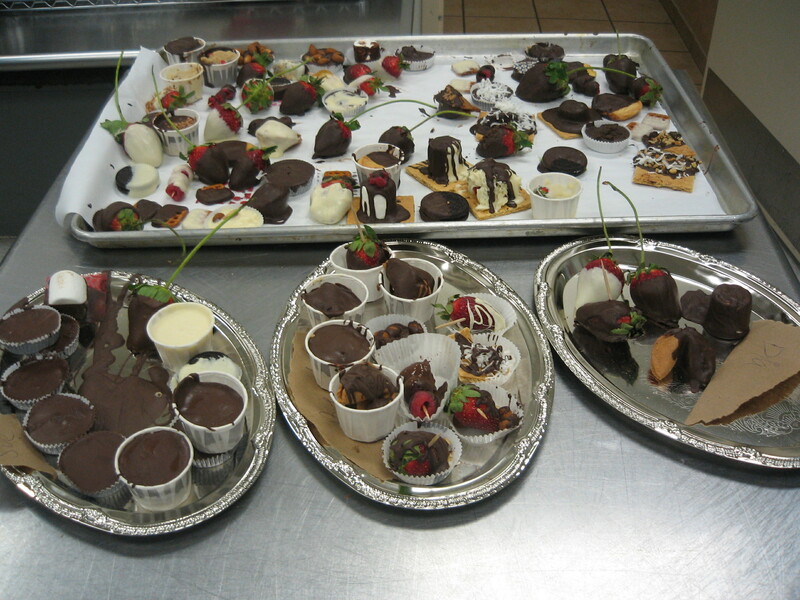 Private events at Sher-Bliss Wine & Chocolates are….sher bliss! What happens at Sher-Bliss stays at Sher-Bliss…unless you tell us otherwise. This group provided pics so others can learn what fun abounds here! 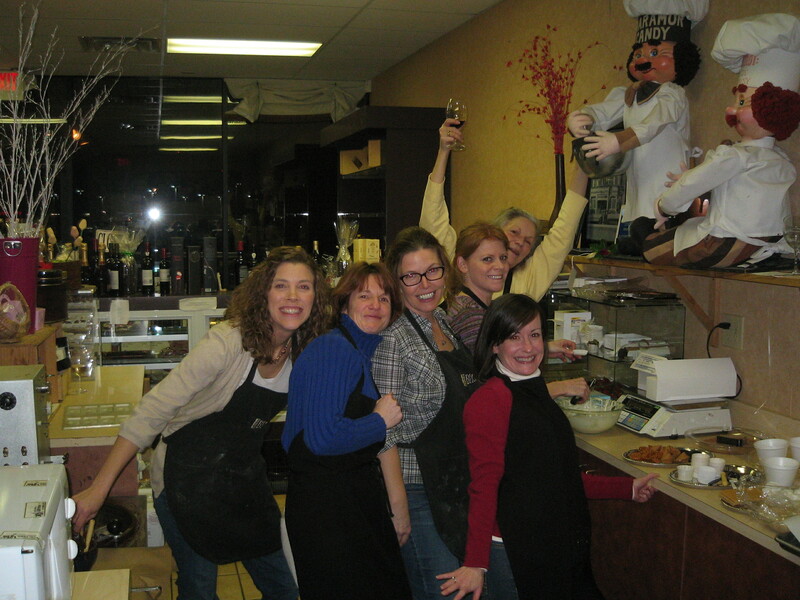 These ladies had a blast at a winetasting, chocolate-making birthday celebration. 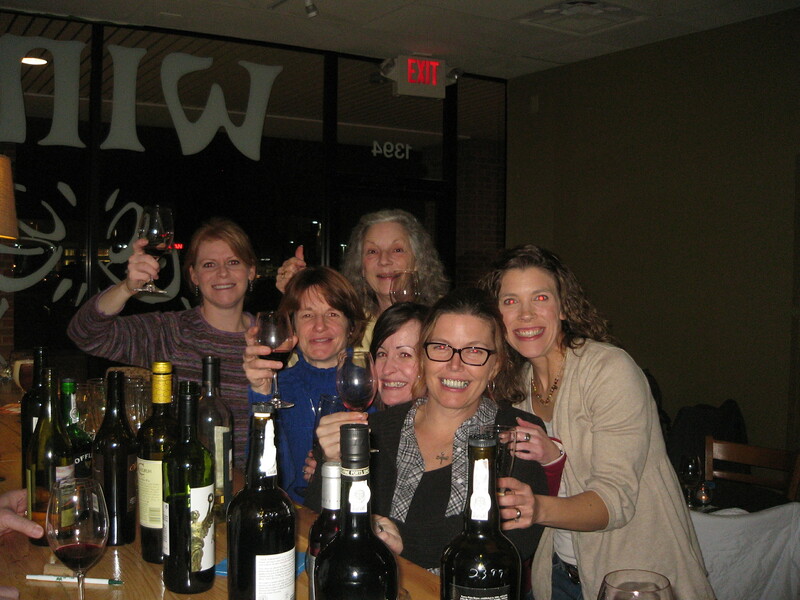 Guests chose four wines paired with chocolates, enjoyed appetizers of chocolate black bean burger sliders, blueberry-sea-salted watermelon and chocolate-dipped fruits. We then turned them loose with a melter full of tempered dark, Belgian chocolate, dippables, enrobeables and candy molds. I have been doing this for a long time and this was a talented bunch of chocolatiers. The most delicious Valentine’s Day ever! Sher-Bliss Wine & Chocolates with you! We have many tips and products to make your Valentine’s weekend a sweet, exciting and romantic one! Whether we are shipping your gift, or you are coming in to select, and/or you join in an in-store event; we know we have what it takes to delight your Valentine. The phone number is 614-428-WINE (9463), email address is cheryl@sherbliss.com and the location is Morse & Cherry Bottom inGahanna,Ohio. Less than 2 miles east ofEaston and the intersection of I-270 & Morse Road. You have no excuses! This Valentine’s Day will be your best ever! Ohhh do we dip strawberries and are they ever divine! There are regularCalifornia berries dipped in our own blend of Belgian milk or dark chocolate, or the highest quality white chocolate. Drizzled and decorated and $30 per pound. As a guideline, our current berries are coming out approximately to $2-3 each. Just a guideline and we can try to find bigger, or smaller. Purchase singly or by the pound. There is a wide variety of packaging from which to choose. Utterly decadent and new this year. (Sigh) A creamy cheesecake layer goes on the berry and then we cover it in your choice of chocolate. A picture is worth a thousand words, but tasting is believing. $35 per pound and a stenciled heart is included with every pound purchased. Colossal long-stem strawberries-presented in the same choices above, but maybe, there are 4 to the pound. SPECIAL ORDER only, call by 5PM on Friday February 10th. 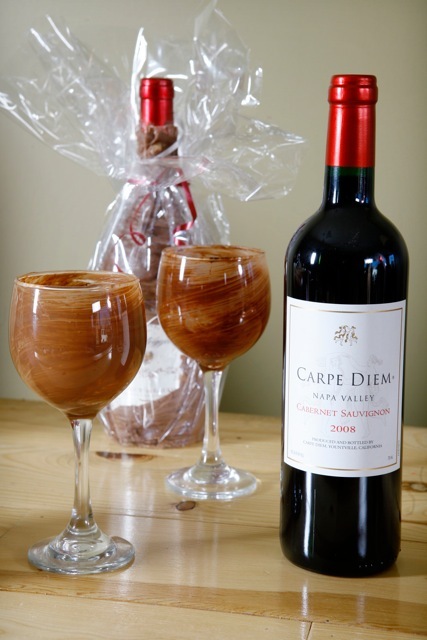 Chocolate and wine unite in one great item. Select one of our 500 labels of small production beer, wine andChampagne, flavor of chocolate and we really have you and this covered with a one-of-a-kind gift. Visit us in-store, or call for expanded selection or at http://www.blissinabottle.com process through the secure, google checkout, selecting a message card and telling us what to write on an enclosure card. We ship UPS ground unless heat, or time requires expedited shipping and can tell you your rates. Someone at least 21 years of age must sign for it and we are unfortunately unable to ship to certain states. For many years I have been pairing chocolate and wine and NOT just for dessert. There are savory combinations we have perfected as well. For this Valentine’s Day and weekend prior, 25 wines will be available in a “pick your flight” line-up to sample, savor, enjoy and later dream about. There are reds, whites and pinks, still and sparkling, sweet and dry, AND cookie dough and cauliflower. The entire menu will be revealed on Friday, February 10th beginning at 7PM. To whet your appetite for this incredible line-up I will share two pairings, but, please, don’t tell anyone! Conundrum 2009 Red, silky, rich and velvety offset with cayenne-spiked milk and dark chocolates. Spann Vineyards 2008 Classic Four Bordeaux-style blend with a medium-sharp white cheddar blended with dark chocolate shavings. The Sher-Bliss store and Blissinabottle.com are now featuring several creative holiday items! 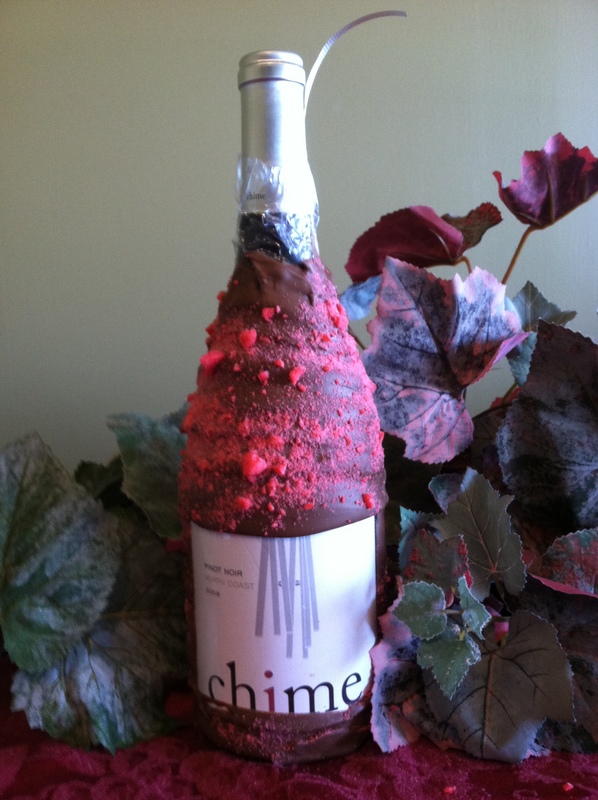 Milk chocolate with crushed cherry flavor covers this Chime Pinot Noir, called the “Best Buy” in Wine Enthusiast’s December 2010 issue. The cherry and chocolate dip compliments well with the red wine’s cherry notes! Order online or check it out at the Sher-Bliss store! 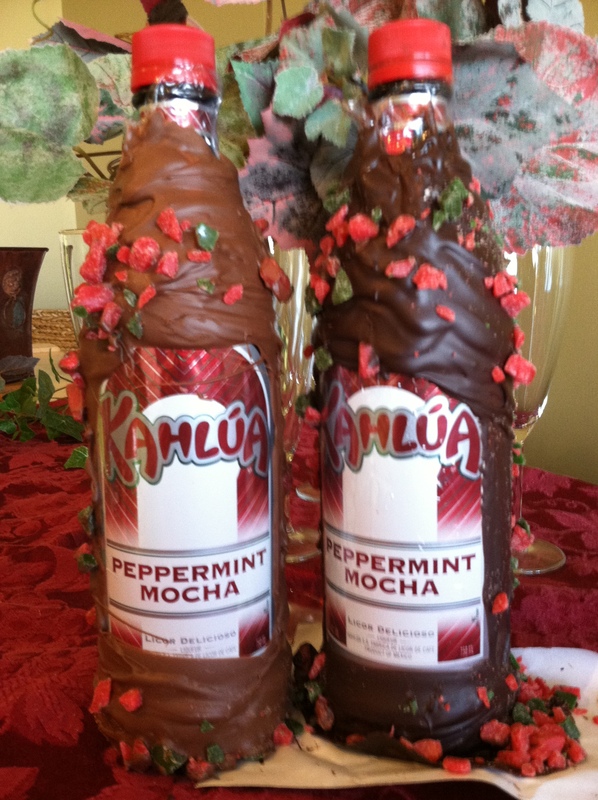 For a limited time only, Sher-Bliss and Blissinabottle.com are offering Peppermint Mocha Kahlua covered in chocolate and crushed peppermint candy pieces. Pick between your choice of milk or dark chocolate dipped bottles for this delicious seasonal item!